On Wikipedia, John White (Reverend) has moved to John White (colonist priest). Just now, fixed the redirection to the particular page, rather than have it go to the page listing all of the John Whites. One nice reference to this page is from capecodtoday.com in their article on Cape Ann which references the Thomas Gardner (planter) page. This page was originally posted in 2010 but has been updated. On the Thomas Gardner page, I have been changing sources to meet the Wikipedia requirements. Once that is done, we can remove the warning which is a distraction. See the Talk page for comments with regard to updates that have been done and are pending. Remember, Wikipedia edits are open to whomever want to help in this matter. 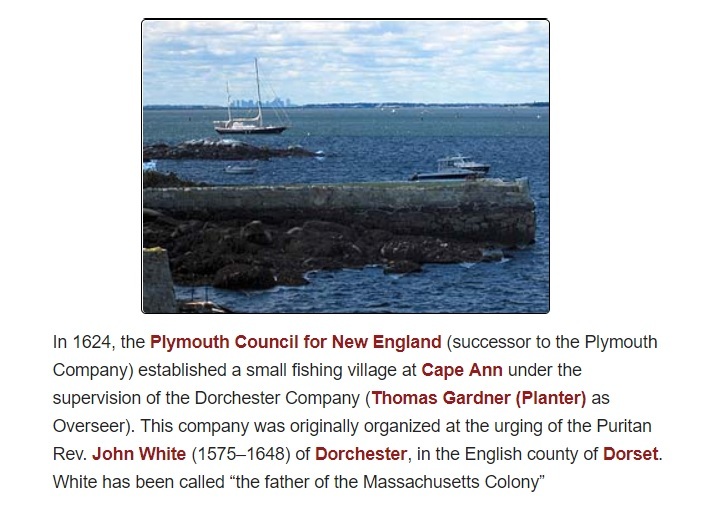 The page for Thomas Gardner (planter) was created on 10 January of 2010. Of the 366 edits, 279 are mine. From the Thomas page, there several auxiliary pages that need attention. I will list these at some point. As we have, Wikipedia, Wikitree, and the blogs plus the two websites to keep current. Example page: Great House (Cape Ann). After hearing from John Goff, I researched this a little more. This is the house that John Endicott had moved to Salem. Thomas and Margaret enjoyed it after most went over to Naumkeag. Much to do. The 400th looms.